Not used but extremely helpful I wish I would have used these!!! 1) Cut your squares for the quilt in the different coordinating patterns. 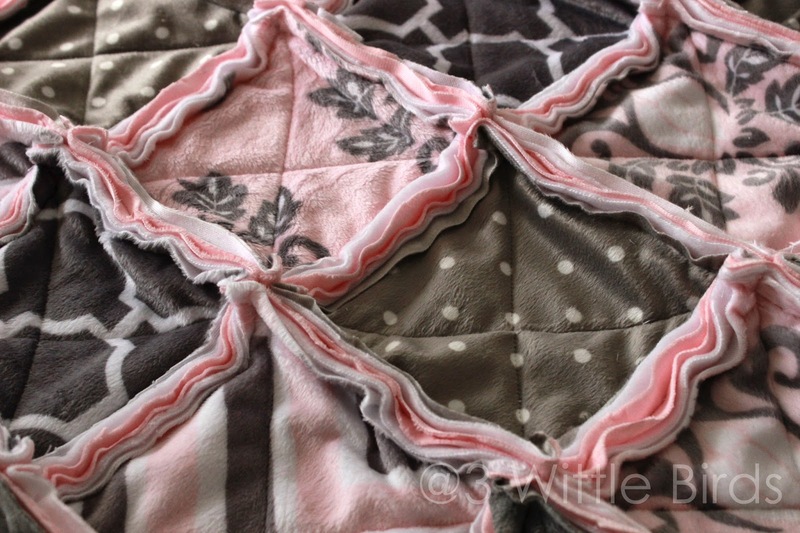 I would recommend for a baby blanket cutting the squares a 10"x10" or a 8"x8". The baby blanket will be a 6 square by 6 square quilt, totaling 36 squares. 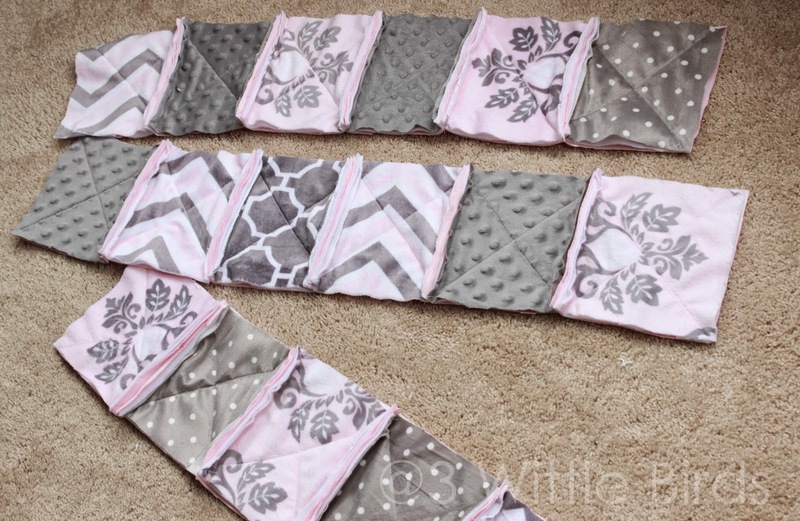 You will need about 8 squares each in the different coordinating fabrics. 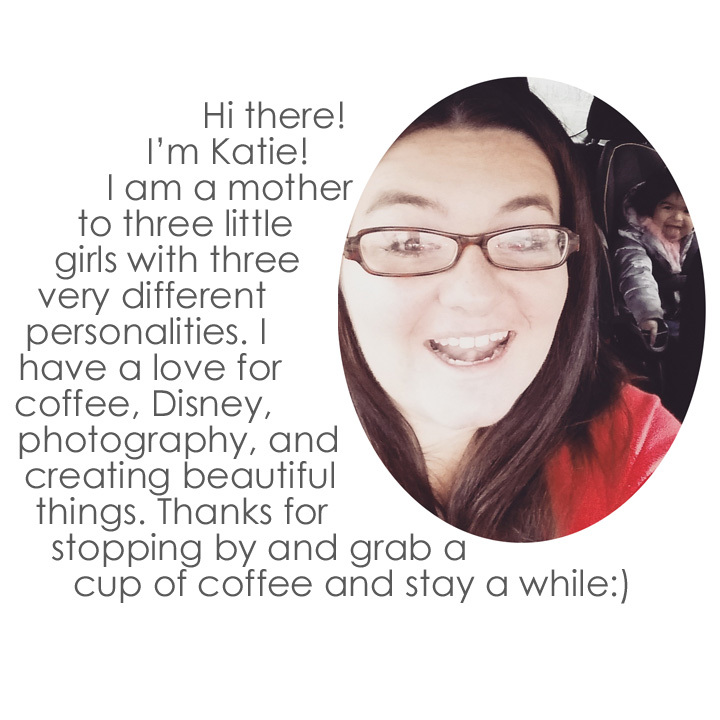 There will be some squares left over but this gives you some options on the overall layout and design. I cut the coordinating fabric squares first. 2)Once all the coordinating fabric squares were cut out, I matched up the fleece and the backing fabric on top of each other. Then, I pinned the already cut squares on top like the picture below. You will want your quilting squares to match up exactly, which is why I choose to cut them out directly from the already cut squares. This will allow them to match up perfectly! 3) After all your squares are cut, you should have 36 pinned squares, 3 layers each. So, you will have your coordinating fabric on top, fleece in the middle, and your backing on the bottom. Make sure your backing is facing out ward when they are stacked. You will then cross stitch each square with a big X from corner to corner. This process takes some time. 4) Once you have your 36 cross stitched squares, you can start to layout the squares in an aesthetically pleasing pattern. I had a lot of grey so I wanted to make sure that the predominately grey squares were not right next to each other. I laid them out every other. 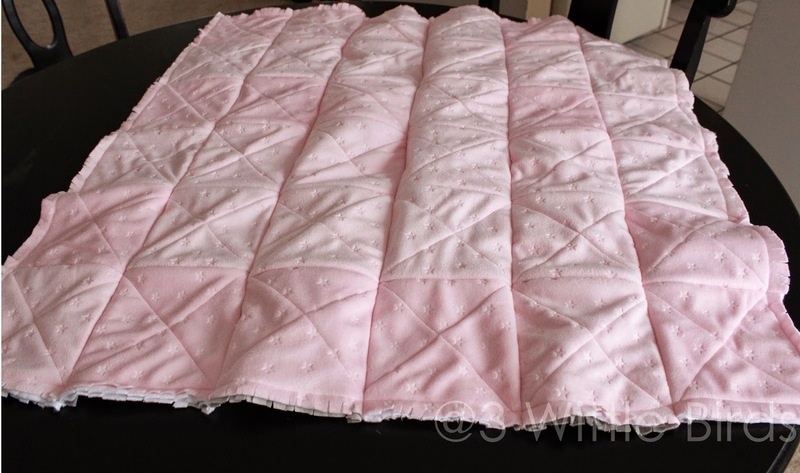 5) Once you have the layout of the blanket, start with rows. 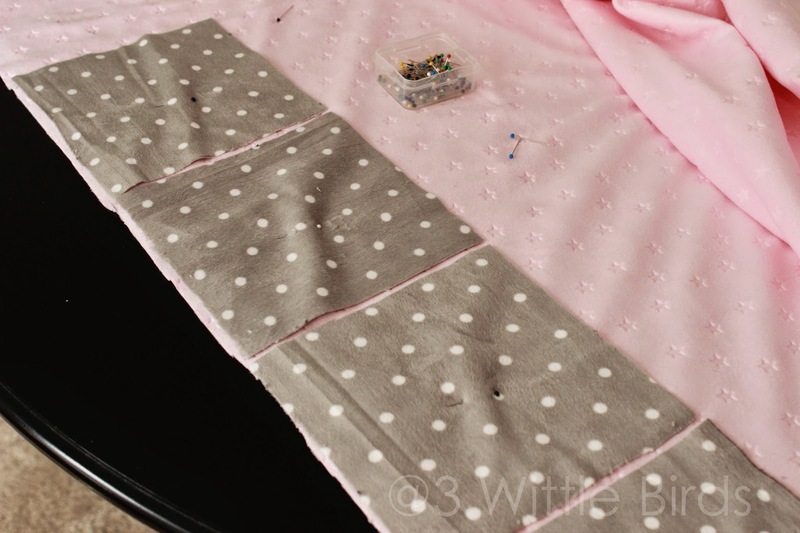 Pin together each square in one row and sew the sides together with a 3/4" seam allowance. In the picture below I have finished three of the six rows. 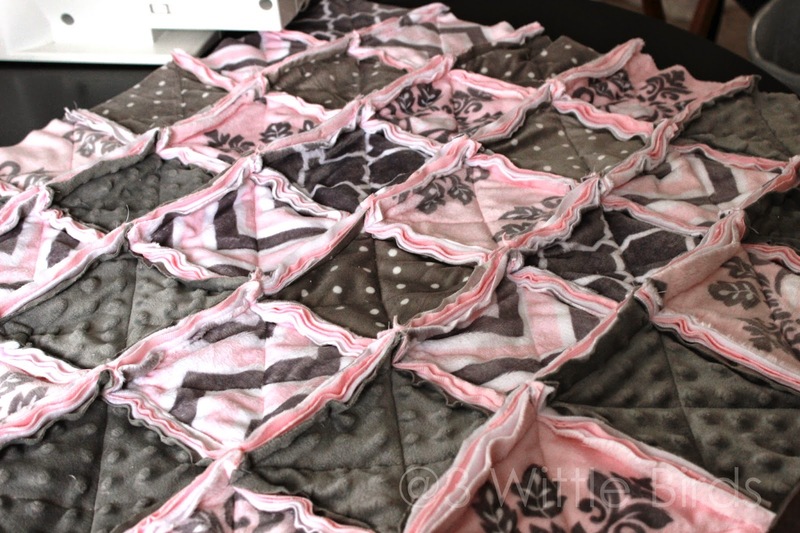 6) When you have finished sewing your 6 rows, pin each row together to start assembling the quilt. 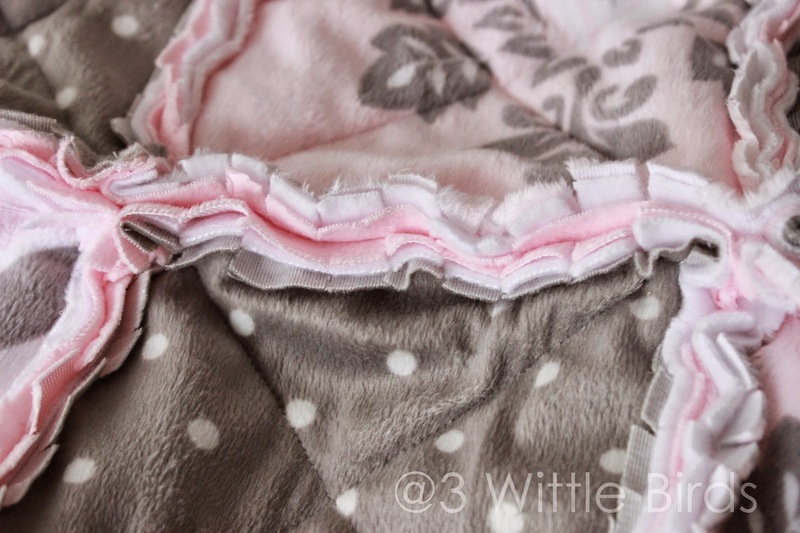 Use the same 3/4" seam, having the sides fold forward with all of the layers. 7) Once all the rows are sown together, stitch around the outside of the entire quilt enclosing all 4 sides. Use the 3/4" seam. 8) Now it's time to clip your excess seam to make that rag quilt effect. I would recommend using a microtip fabric scissor. Make sure you don't cut your stitching! This process also took some time. Over the course of a couple days and downtime I was able to complete the clipping. 9) Wash your quilt on a short delicate cycle. 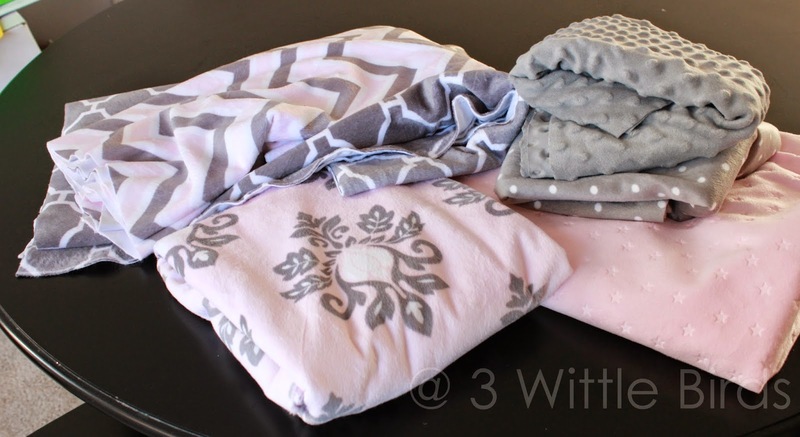 Dry your quilt on a regular cycle. The drying will help fray your clippings and make it look super cute!